The international Daya Bay Collaboration has announced new results about the transformations of neutrinos - elusive, ghostlike particles that carry invaluable clues about the makeup of the early universe. The latest findings include the collaboration's first data on how neutrino oscillation – in which neutrinos mix and change into other "flavors," or types, as they travel – varies with neutrino energy, allowing the measurement of a key difference in neutrino masses known as "mass splitting." "Understanding the subtle details of neutrino oscillations and other properties of these shape-shifting particles may help resolve some of the deepest mysteries of our universe," said Jim Siegrist, Associate Director of Science for High Energy Physics at the U.S. Department of Energy (DOE), the primary funder of U.S. participation in Daya Bay. 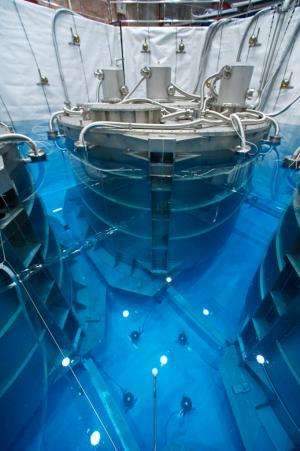 U.S. scientists have played essential roles in planning and running of the Daya Bay experiment, which is aimed at filling in the details of neutrino oscillations and mass hierarchy that will give scientists new ways to test for violations of fundamental symmetries. For example, if scientists detect differences in the way neutrinos and antineutrinos oscillate that are beyond expectations, it would be a sign of charge-parity (CP) violation, one of the necessary conditions that resulted in the predominance of matter over antimatter in the early universe. The new results from the Daya Bay experiment about mass-splitting represent an important step towards understanding how neutrinos relate to the structure of our universe today. "Mass splitting represents the frequency of neutrino oscillation," says Kam-Biu Luk of the U.S. Department of Energy's Lawrence Berkeley National Laboratory (Berkeley Lab), the Daya Bay Collaboration's Co-spokesperson, who identified the ideal site for the experiment. "Mixing angles, another measure of oscillation, represent the amplitude. 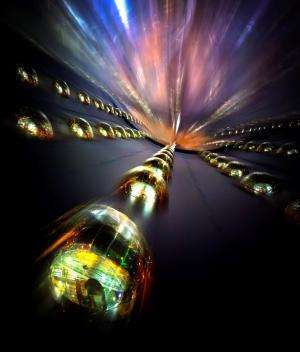 Both are crucial for understanding the nature of neutrinos." Luk is a senior scientist in Berkeley Lab's Physics Division and a professor of physics at the University of California (UC) Berkeley. The Daya Bay Collaboration, which includes more than 200 scientists from six regions and countries, is led in the U.S. by DOE's Berkeley Lab and Brookhaven National Laboratory (BNL). The Daya Bay Experiment is located close to the Daya Bay and Ling Ao nuclear power plants in China, 55 kilometers northeast of Hong Kong. The latest results from the Daya Bay Collaboration will be announced at the XVth International Workshop on Neutrino Factories, Super Beams and Beta Beams in Beijing, China. "These new precision measurements are a great indication that our efforts will pay off with a deeper understanding of the structure of matter and the evolution of the universe – including why we have a universe made of matter at all," says Steve Kettell, a Senior Scientist at BNL and U.S. Daya Bay Chief Scientist. U.S. contributions to the Daya Bay experiment include coordinating detector engineering; perfecting the recipe for the liquid used to track neutrinos in the Daya Bay detectors; overseeing the photo-detector systems used to observe neutrino interactions and muons; building the liquid-holding acrylic vessels and the detector-filling and automated calibration systems; constructing the muon veto system; developing essential software and data analysis techniques; and managing the overall project. Daya Bay's first results were announced in March 2012 and established the unexpectedly large value of the mixing angle theta one-three, the last of three long-sought neutrino mixing angles. The new results from Daya Bay put the precise number for that mixing angle at sin2213=0.090 plus or minus 0.009. The improvement in precision is a result of having more data to analyze and having the additional measurements of how the oscillation process varies with neutrino energy. The energy-dependence measurements also open a window to the new analysis that will help scientists tease out the miniscule differences among the three masses. From the KamLAND experiment in Japan, they already know that the difference, or "split," between two of the three mass states is small. They believe, based on the MINOS experiment at Fermilab, that the third state is at least five times smaller or five times larger. Daya Bay scientists have now measured the magnitude of that mass splitting, |?m2ee|, to be (2.540.20)10-3 eV2. MINOS, and the Super-K and T2K experiments in Japan, have previously determined the complementary effective mass splitting (?m2??) using muon neutrinos. Precise measurement of these two effective mass splittings would allow calculations of the two mass-squared differences (?m232 and ?m231) among the three mass states. KamLAND and solar neutrino experiments have previously measured the mass-squared difference ?m221 by observing the disappearance of electron antineutrinos from reactors about 100 miles from the detector and the disappearance of neutrinos from the sun. UC Berkeley and Berkeley Lab's Bill Edwards, Daya Bay's U.S. Project and Operations Manager, says, "The ability to measure these subtle effects with greater and greater precision is a testament to the scientific and engineering team that designed and built this exceptional experiment." U.S. scientists are also laying the groundwork for a future neutrino project, the Long-Baseline Neutrino Experiment (LBNE). This experiment would use high intensity accelerators at Fermi National Accelerator Laboratory to produce high-energy muon neutrinos and aim them at detectors 1,300 kilometers away in South Dakota, a distance from neutrino source to detector needed to observe the transformations of high-energy muon neutrinos. LBNE would detect the appearance of the other two flavors at the far-away detector in addition to the disappearance of one flavor of neutrino as evidence of oscillation. The combined results from LBNE and other global neutrino experiments will give scientists new ways to test for violations of fundamental symmetries, and open other avenues to understanding the structure of the universe today. I suppose someone has to do the experiments to confirm that the distances between A,B and C are the same when measured from A,B or C ( i.e. all possible electron, Muon and Tau :delta Mass measurements). Does this mean there will be a total of 600 disappointed scientists when they find that, unsurprisingly, the measurements are the same, and Mass/energy is indeed conserved in Neutrinos. The international Daya Bay Collaboration has announced new results about the transformations of neutrinos - elusive, ghostlike particles that carry invaluable clues about the makeup of the early universe…. U.S. scientists are also laying the groundwork for a future neutrino project, the Long-Baseline Neutrino Experiment (LBNE)…... The combined results from LBNE and other global neutrino experiments will give scientists new ways to test for violations of fundamental symmetries, and open other avenues to understanding the structure of the universe today. EyeNStein: we do take relativity into account for these several species of muons, and we do know that energy is conserved in neutrinos. What we're interested in knowing is why it is that neutrinos have different "mass eigenstates" than "flavor eigenstates." Ie, while they are created with a certain flavor to satisfy the dynamics of the process that creates them, as they propagate forward, the relevant term is their mass term. And the mass term doesn't exactly correspond to one specific flavor of neutrino. So they seem to zip off and change flavor as they do so because they keep their mass constant. vacuum-mechanics: They need your help like they need a slightly loose fiber optic connection. shavera: I do hope they come up with an interesting anomaly. But as I understand it: The superpositions of the three (or maybe six if the anti-neutrinos differ.) mass eigenstates as a neutrino travels, only vary in their mixing proportions, so that the mean mass can remain at whatever constant value it should be for the particular flavour of source neutrino observed. This 'oscillation', which is due to the different masses of the three superimposed neutrino flavours travelling at slightly different velocities seems to be fairly clearly understood now. (Unless I've missed something) So it still looks like tears before bedtime for 600 physicists of 3 different experiments when they confirm what seems to be already understood. Here is a pictorial representation of the oscillation/mixing of neutrinos. It shows how by sinusoidaly varying the mixtures of three unique neutrino Eigenstates, a mean mass value corresponding to whichever of 3 type of source neutrino is conserved.